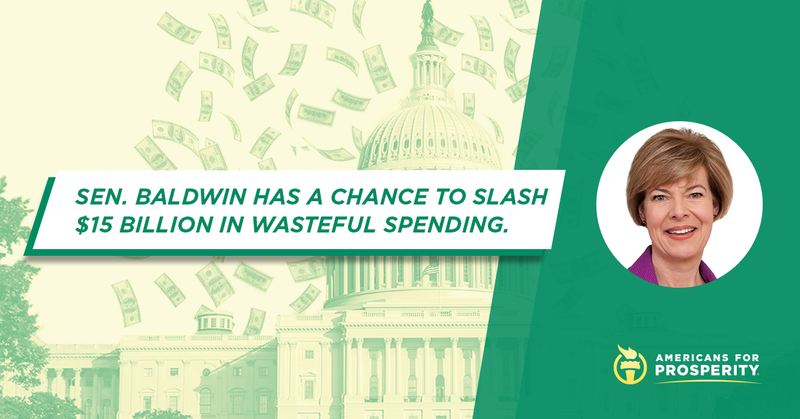 Press Releases Americans for Prosperity-Wisconsin: To Tammy Baldwin: Stop overspending! MADISON, WI – Americans for Prosperity-Wisconsin (AFP-WI) today launched a statewide digital advertising campaign to encourage U.S. Senator Tammy Baldwin to support a measure recently passed by the House of Representatives that would save taxpayers over $15 billion. The free-market activist group launched the ads as part of AFP’s national “Stop Overspending” campaign to encourage Members of Congress from both political parties to confront Washington’s spending problem and embrace fiscal responsibility. AFP-WI kicked off the “Stop Overspending” campaign last month by thanking U.S. Representative Glenn Grothman for his vote against a reckless trillion-dollar spending bill. While tax reform was a significant achievement for hard-working Americans, AFP-WI has long-advocated the importance of pairing tax cuts with spending restraint to grow the economy and improve the lives of all Americans. Unchecked spending in Washington threatens to undermine economic growth. The launch of AFP’s “Stop Overspending” campaign over Memorial Day recess included robust digital, direct-mail, print, and radio advertising in congressional districts across the country. President Trump’s $15.3 billion rescission plan proposed earlier this month presents an opportunity for lawmakers to demonstrate fiscal responsibility by supporting this modest attempt to undo some of the overspending damage. AFP’s digital ads encouraging support for the spending will focus on Republican Senators Roy Blunt (R-MO), Shelley Moore Capito (R-WV), Dean Heller (R-NV), John Hoeven (R-ND), Lisa Murkowski (R-AK), Jerry Moran (R-KS), Mike Rounds (R-SD), Marco Rubio (R-FL), John Thune (R-SD), Richard Shelby (R-AL), and Roger Wicker (R-MS) and Democrat Senators Tammy Baldwin (D-WI), Sherrod Brown (D-OH), Bob Casey (D-PA), Joe Donnelly (D-IN), Martin Heinrich (D-NM), Heidi Heitkamp (D-ND), Doug Jones (D-AL), Tim Kaine (D-VA), Joe Manchin (D-WV), Claire McCaskill (D-MO), Bill Nelson (D-FL), Tina Smith (D-MN) and Jon Tester (D-MT).